Essential brushwork techniques to better connect with your viewers. Conveying your emotional response to a subject as an artist can really engage viewers. There are a number of brushwork techniques that will help you achieve this, lifting a simple observation to an exciting work of art. These are things that you can begin using right away in your own paintings. For this article we're using oil paints, but these techniques can be used with a variety of other media as well. 'Painting by the pound' can add energy and emotion to a painting. Use thick gobs of pigment on the brush, then place them on the canvas with a soft touch, keeping the brush nearly parallel to the surface. Lightly drag it across the painting, because too much pressure flattens the stroke. Let the paint stand proud to create texture. When painting by the pound, the viscosity of the paint is crucial. Paint that’s too stiff or too thin doesn’t work. A consistency that’s similar to mayonnaise is perfect, along with an adequate quantity of paint on the brush. Strive to place 'pieces of paint' on the surface of the painting. A palette knife will also help you to achieve a similar effect. Again, use a thick load of buttery pigment on the bottom of the knife and apply it lightly to the surface of the painting. Don’t press or scrape. Hold the blade flat to the canvas and let it skip and jump as it skitters lightly across the surface. Load paint on the knife using only the bottom of the blade, not the top. Be generous and use enough paint to make a powerful mark. When you place a stroke, be bold and make a dramatic statement, then leave it alone. Too much correcting leads to a muddy effect instead of the lively look we’re after. Thinly painted areas with soft edges create a gentle, restful mood. For this you can use large filberts to cover big areas of a painting. Blend one shape or colour into another and work back and forth, wet-into-wet. Use enough medium in the paint to keep it soft and juicy when striving for this effect. When you want to soften smaller areas or edges in a painting, using your fingertip offers more control than a brush, especially in small areas. If you’re using toxic pigments, it’s a good idea to wear a rubber glove for this. Strokes with crisp, well-defined edges contrast nicely with softer areas of a composition. Use brights for these strokes (a short-bristled version of a flat). Press firmly when making the stroke, then leave it alone to avoid blending and to maintain crisp edges. You can use riggers to create two very different effects. The first is that when painting a tree limb, get a thick load of paint on the brush and then drag it lightly over the canvas. The second is when using a rigger to create a soft, graceful stroke, use thinned-down paint and thoroughly wet the entire length of the bristles. Then, slowly drag the brush over the surface, allowing the bristles to trail along in a smooth line. When the brush runs out of paint, the stroke is finished. At the finish of a painting, bring it to life by adding little accents or 'clicks and pops'. Plan ahead to deliberately maintain some areas of soft, diffused strokes and subtle hues. Into these areas, place a few tiny strokes of lively hues and brighter values that add a subtle sparkle to the piece. 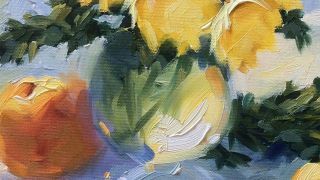 Optical colour-mixing is another great technique, which involves layering dry-brushed strokes of colour lightly over an underpainting that’s a different colour. It’s important to let the brush skip and jump over the underpainting so that both hues remain visible. The eye reads them as a blended colour that isn’t actually present on the canvas. Begin by underpainting several areas of thin paint and then wait while they become either tacky or completely dry. Then mix your colours that look interesting with those underpainted hues and lightly drag a brushload across the surface, allowing it to incompletely cover the underpainting. This is another way to add extra sparkle to your work. This piece (above) uses several techniques – soft, blurry edges of gently blended colours contrast with thickly textured paint placed with bold strokes. There are little clicks and pops in areas that would otherwise be uninteresting. And it also combines richly saturated hues with relaxed areas of desaturated colour. The example above uses the painting by the pound approach as well as a variety of clicks and pops. Notice that these small accents of colour were placed in spots where they stand out, and also notice that many of the hues used seem foreign to the colour scheme used elsewhere. This works well when used in small amounts. Here, optical colour mixing was used in the background, while the face uses a combination of softly blended areas contrasted with crisp-edged strokes. If you look closely you’ll see a few other techniques as well. Why not give some of these brushstroke techniques a try today? This article originally appeared in Paint and Draw issue 9. Buy it here.